Ada Lovelace, "The Enchantress of Numbers"
Ada Lovelace, as she is now most commonly remembered, was the daughter of George Gordon, lord Byron, and his wife, Anne Isabella Milbanke. The couple was famously ill-matched, their marriage nothing short of a disaster. After a year of marriage, the pair separated in January 1816, just a month after their daughter's birth (Byron seems to have been positive the baby would be a boy). Byron left England four months later and never saw his daughter again. Ada's upbringing was shaped--or perhaps marred--by her mother's intense fear that her daughter would in any way resemble her father. Convinced that Byron was not only immoral but insane, Annabella Milbanke devised a plan of education for her Ada that would eliminate the dangerous effects of poetry and focus, instead, on mathematics, logic, and science. Ada proved an apt pupil. (One of her correspondents and mentors was the mathematician and scientist Mary Fairfax Somerville--who was nominated to the Royal Academy of Science at the same time as Caroline Herschel and for whom Somerville College [Oxford] is named). She also developed an ongoing partnership with the mathematician Charles Babbage, the Lucasian Professor of Mathematics at Cambridge and inventor of the difference machine, a complex calculating machine. They had begun their correspondence in 1833, when she was just seventeen. To her translation, Lovelace appended a series of notes, A through G, her notes three times as long as the Menabrea article she translated. These notes represent her contributions to mathematics in general and to computers and computing in particular. She speculated that the Engine "might act upon other things besides number. . . . [T]the Engine might compose elaborate and scientific pieces of music of any degree of complexity or extent." The idea of a machine that could manipulate symbols in accordance with rules and that number could represent entities other than quantity mark the fundamental transition from calculation to computation. Ada was the first to explicitly articulate this notion and in this she appears to have seen further than Babbage. She has been referred to as "prophet of the computer age." Certainly she was the first to express the potential for computers outside mathematics. Ada Lovelace is today widely recognized and appreciated--there are many biographies, websites (I like Finding Ada: Celebrating the Achievements of Women in Science, Technology, Engineering and Maths and the Ada Initiative: Supporting Women in Open Technology and Culture--although this site, unfortunately, shut down in October 2015, while keeping the archive available), stickers, necklaces, coffee mugs, and even a graphic novel, The Thrilling Adventures of Lovelace and Babbage. But there is also more than a little resistance to crediting Ada Lovelace with contributing to the development of computers and computing. (That's why I've linked to the Computer History Museum here--nothing like recognition for Ada Lovelace coming straight from Mountain View, CA, with video promos for the museum and its exhibits featuring Bill Gates and Steve Wozniak.) 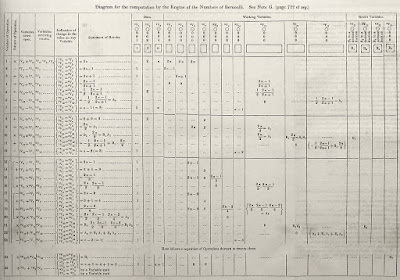 For an interesting essay on the resistance, check out the Ada Initiative's exploration of the issue, "Deleting Ada Lovelace from the History of Computing," by clicking here. 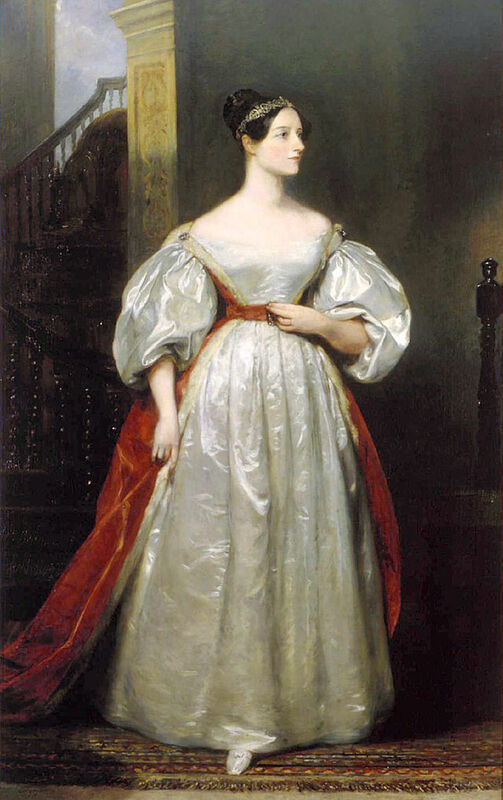 Ada Lovelace died on 27 November 1852, just days before her thirty-seventh birthday.